Size: 56.5 x 49 cms. Title: 'EUROPA Secundum legitimas Projectionis Stereographicae regulas et juxta recentissimas observationes aeque ac relationes adhibitis quoque veterum monumentorum sub sidiis descripta et in partes suas methodicas X divisa a IOH. MATTH. HASIO Math. P.P.O. edita curis Homannianorum Heredum A MDCCXXXXIII'. 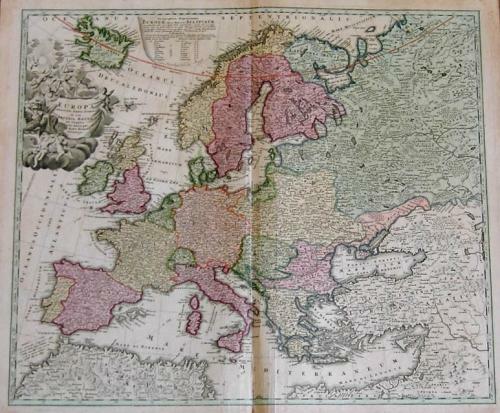 A rich engraving of the continent of Europe with a lavish cartouche and original colour. The map is in excellent condition with no discernible faults. The shadow at the centrefold has been caused when photographing the map.